J. Edgar Hoover was one of the most famous and influential men of the twentieth century. He built the Federal Bureau of Investigation into the best investigative entity in the world and facilitated the capture of John Dillinger, Alvin Karpis and other high-profile hoods during a time of lawlessness in America. He was instrumental in bringing to justice the alleged perpetrator, one Bruno Hauptmann, in the “crime of the century,” the kidnapping and murder of the infant son of Charles Lindbergh. He was a patriot, a man of principle and conviction who wasn’t above exaggerating his own accomplishments in his memoirs. In the new movie, J. Edgar (directed by Clint Eastwood) Leonardo DeCaprio plays the man who was known to his intimates simply as “Edgar.” In spite of his professional accomplishments, Edgar’s personal life was conflicted. He never married and, being of a decidedly homosexual bent, was never comfortable in that role. In one scene, where he is trying, as a young man, to explain to his devoted mother (Judi Dench) that he “doesn’t like dancing with women,” she tells him she would rather have a dead son than a daffodil (gay) son. (We’re speaking in metaphors here.) This is not exactly a ringing endorsement of his sexual proclivities. The subject of Edgar’s homosexuality is never sensationalized here. We never see him cruising gay bars or propositioning male prostitutes. It’s plain, though, where his sympathies lay. The most important figure in his life (besides his mother) is Clyde Tolson (played by Armie Hammer, who played both Winklevoss twins in The Social Network). Clyde was Edgar’s friend, confidante, and business associate and at one time the number-two man at the FBI. Edgar and Clyde go on vacations together, share hotel rooms and intimate meals. Clyde advises Edgar on matters of fashion. They seem to spend every moment together. However, as we are told in the movie, they never shared a physical relationship. Clyde doesn’t balk at telling Edgar that he loves him; Edgar is not able to respond in kind. He is not able to show the most important person in his life how he feels about him. 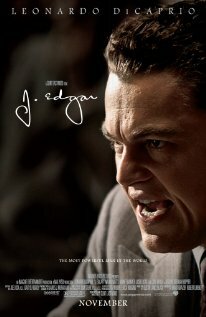 In Titanic and The Aviator and other movies, Leonardo has just been Leonardo (however good that might be), but in this movie Leonardo seems submerged (with the help of what must be several pounds of makeup) in the persona of J. Edgar Hoover. For my money, this seems to be the part Leonardo was born to play. I believed him every step of the way. If he isn’t in serious contention for an Oscar, there’s something wrong with those movie people. He would get my vote if I had one. Another standout in the cast is Naomi Watts (who I can’t see without thinking of King Kong). She plays Edgar’s sympathetic secretary, Helen Gandy. She is one of the few people in the world Edgar trusts. In what seems a thankless job, she is loyal to the end and will do whatever she must do to protect Edgar and his legacy. While the movie seems slow to start (it takes about fifteen minutes for it to take off) and is darkly lighted (all the interiors seem dark), these are minor quibbles in an otherwise excellent movie. J. Edgar is not a bad way to spend 138 minutes sitting in a darkened movie theatre. On a personal note, however, I, for one, am getting tired of seeing Richard Nixon portrayed as a foul-mouthed lunatic. He must have had some relatively sane moments in his life where he was actually sincere about something. Can’t we ever see any of those?